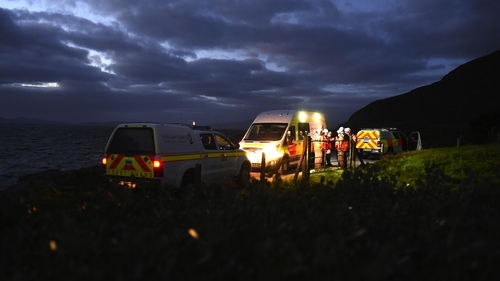 The bodies of three men have been recovered from the water close to their upturned rib near Coonanna in south Kerry. The alarm was raised at around 6pm this evening when the bow of the rib was seen jutting out of the water. The Coast Guard helicopter, Shannon Rescue 115, Valentia lifeboat, Coast Guard teams from Valentia and Iveragh along with local gardaí and local drivers responded. Shannon helicopter crew recovered the first body close to Coonanna pier, soon after arriving on scene. The helicopter crew subsequently recovered the bodies of the two other men several hundred metres from the shoreline. The first body was transferred to an ambulance crew on Coonana pier. The other two bodies are en route to Kerry Airport from where they will be brought to University Hospital Kerry in Tralee. It is understood all three men are from eastern Europe and that they were on a fishing trip which they made regularly. Weather conditions at the time were described as fresh with swells of up to 3 metres. A garda investigation into the incident is now under way.